Most of us think of chocolate as a sweet candy created during modern times, but actually, chocolate dates back to the ancient peoples of Mesoamerica who mixed ground cacao seeds with various seasonings to make a spicy, frothy drink. For these people, chocolate wasn't just a favourite food, it also played an important role in their religious and social lives. The history of chocolate starts about 2,000 years ago when the tasty secret of the cacao (kah KOW) tree was discovered by ancient Maya, in the tropical rainforests of the Americas. The pods of this tree contain seeds that can be processed into chocolate. The Maya and their ancestors in Mesoamerica took the tree from the rainforest and grew it in their own backyards, where they harvested, fermented, roasted, and ground the seeds into a paste. By 1400, the Aztec empire dominated a sizeable segment of Mesoamerica. The Aztecs traded with Maya and other peoples for cacao and often required that citizens and conquered peoples pay their tribute in cacao seeds, a form of Aztec money. Chocolate also played a special role in both Maya and Aztec royal and religious events. 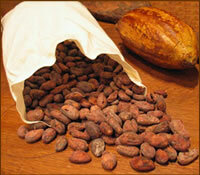 Priests presented cacao seeds as offerings to the gods and served chocolate drinks during sacred ceremonies. The history of chocolate in Europe came during the conquest of Mexico in 1521. The Spaniards recognized the value attached to cacao and observed the Aztec custom of drinking chocolate. Soon after, the Spanish began to ship cacao seeds back home, they doctored up the bitter brew with cinnamon and other spices and began sweetening it with sugar. They managed to keep their delicious drink a Spanish secret for almost 100 years before the rest of Europe discovered what they were missing, but then only those with money could afford to drink it as cacao and sugar were expensive imports. Eventually, to keep up with the demand for chocolate, Spain and many other European nations established colonial plantations for growing cacao and sugar. For centuries, chocolate remained a handmade luxury sipped only by society's upper crust. But by the 1800s, mass production made solid chocolate candy affordable to a much broader public. The first European chocolate factory was setup in France in 1761 in the town of Bayonne. Exports at the time were limited to mainly Spain and Paris. The first hydraulic machine for crushing and mixing the chocolate paste was invented in 1778 and in 1819 the first steam-powered production plant was built. Many famous chocolate companies today were founded as family run businesses in Europe such as Van Houten in the Netherlands in 1815, Menier in France in 1824, Cadbury and Rowntree in England; and Suchard, Nestlé, Lindt and Kohler in Switzerland. After about 1850 the production of chocolate became a global business and production facilities were setup all around the world. To meet the demands of today's global market, chocolate manufacturing relies on both ancient techniques in the field and new technologies in the factory.